In the photo are Aerial’s team members, left to right, front row (with school attending) Reagan Oliver (Wilmington); Adi Rainwaters (Waynesville); Alli Knecht (Miami Trace); Dana Holloway (Greeneview); Julia Deaton (Waynesville); Bela Castillo (Wilmington); second row, Samantha Woodruff (East Clinton); Aimee George (Clinton-Massie); Kealey James (Blanchester); Shaylee Slagle (East Clinton); Ashleigh Weaver (Waynesville); third row, Zyra Crume (Waynesville); Makenna Tolliver (Wilmington); Sofia Castillo (Wilmington); Haylie Strider (Clinton-Massie); Cali Layne (Waynesville); Erin Dukes (Wilmington); back row, Shayla Earley (Wilmington); Sammi Shepherd (Leesburg Fairfield); Kaylee Earley (Hillsboro); Megan Conover (Hillsboro); Olivia Feldhaus (Waynesville); Bailey Moyer (Wilmington); Taylor Dukes (Wilmington). 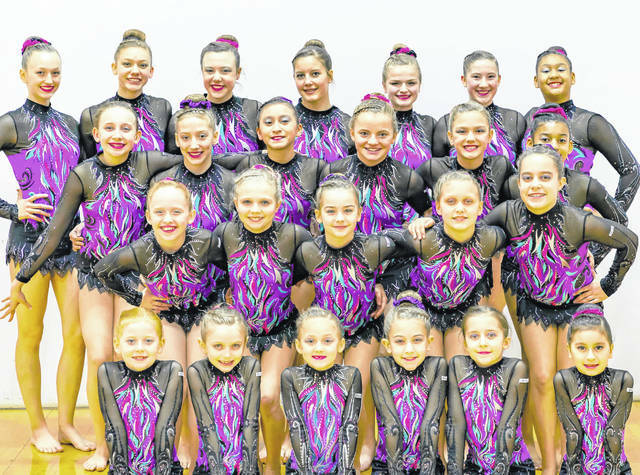 Although Aerial’s athletes have had a long history of success in their sport of acrobatic gymnastics, most of the success has been at the state, regional and national levels. This week will be a different type of competition for the local team. The 24 member Aerial’s acro team will travel to Las Vegas to compete in the Vegas Acro Cup/FIG World Cup International event. The large international competition will feature more than 1,200 athletes from more than 12 countries representing four continents. World champion medalists from Russia, China, and other countries will attend the four-day competition, according to a press release from Aerial’s. Aerial’s athletes range in age from 7 to 17 and will be competing mostly in Levels 6-8. However, the trio of Sammi Shepherd, Megan Conover and Kealey James will be competing in the highly competitive Junior Elite Division. The trio attended the event last year as a Level 10 trio and earned the bronze medal. The difference this year is that it is now a World Cup event attracting more teams from more countries than attended last year. “We’re going to face some of the best in the world this week,” said Aerial’s head coach Angie Layne. “Earning another bronze, or any medal, regardless of the level is going to be difficult. Our athletes have been training for this event since August and are prepared. I wouldn’t ask them to attend an event that is ‘out-of-their-league’ but each of them definitely need to perform at the top of their potential to medal at this event. The Aerial’s are coached by Mary Ann Carson, Taylor Coombs, Angie Layne, Jayme Maynard and Ashley Willian. Competition results and coverage can be found at www.vegasacrocup.com.